Elvis Presley is one of the greatest musicians the world has ever seen. Known as the king of rock and roll, Presley sold hundreds of millions of albums and received numerous awards both in his lifetime and posthumously. The American singer not only revolutionized rock music but also made an unforgettable impact on the 20th-century pop culture. Even though Presley died over 40 years on, his influence still lives on. Want to know about the family that he left behind and what they have been up to since his death? Then come with me. Elvis Aaron Presley was born on the 8th of January 1935 in Tupelo County, Mississippi. His parent’s names were Vernon and Gladys Presley. The young Presley grew up poor and his family had to rely on government assistance as well as the assistance of neighbors. In 1948, the family relocated to Memphis Tennessee. It was there that Presley completed his education, graduating from L. C. Humes High School in 1953. Even though it may sound like a cliché, Elvis Presley’s journey into music was first inspired by the church. From there on he started singing in school. He continued his singing even though his eighth-grade music teacher told him that he lacked the aptitude for it. Elvis Presley began his music career in 1954 when he released the singles, That’s All Right” and “Blue Moon of Kentucky, on the label of Sun Records. The songs made him a popular sensation overnight, with many record labels struggling to sign him. He eventually signed on to RCA Records in 1955. In a career spanning over two decades, Elvis Presley released over 23 studio albums which spurned hits such as If I Can Dream, Suspicious Minds, Jailhouse Rock, In The Ghetto, Kentucky Rain, Mystery Train, An American Trilogy, Heartbreak Hotel, Love Me Tender, Can’t Help Falling In Love etc. He also featured in about 30 movies, for which he did the accompanying soundtrack albums. Presley sold over 600 million albums in his career and holds several records. Among the many records he set are the best selling solo artist, most songs to reach billboard top 40 (114), most songs to reach billboard top 100 (151) and most albums to reach Billboard top 200 (129). The king is also third on the list of artists with most number one songs – 17. Elvis Presley received several awards including three Grammies as well as a Grammy lifetime achievement. His brand of rock, known as rockability, was influenced by the gospel songs he heard in church, country music from the US South and the black R&B he absorbed on Beale Street as a Memphis teenager. Elvis Presley was married to Priscilla Ann Presley (nee Wagner or Beaulieu). She is an American actress and businesswoman and they met in Germany in September 1959 while he was stationed there. Presley was 24 at the time while Priscilla was 14, and they immediately took to each other. They dated for seven and a half years before getting married on the 1st of May 1967 in Las Vegas. Their only child, Lisa Marie, was born exactly nine months after their wedding, on the 1st of February 1968. The marriage was dogged by extramarital affairs on both sides. They separated in February 1972 and the divorce was finalized in October 1973. Following Presley’s death in 1977, Priscilla became the executor of his estate as their daughter was still too young. She worked hard to turn around the fortunes of Presley’s Graceland Mansion, turning it into a money yielding tourist attraction. She also became an actress, starring in three successful “Naked Gun” films in the ’80s and ’90s. In 1984, Priscilla commenced a relationship with producer-director Marco Garibaldi. It lasted for 22 years before coming to an end in 2006. The relationship produced a son, Navarone, born in 1987. 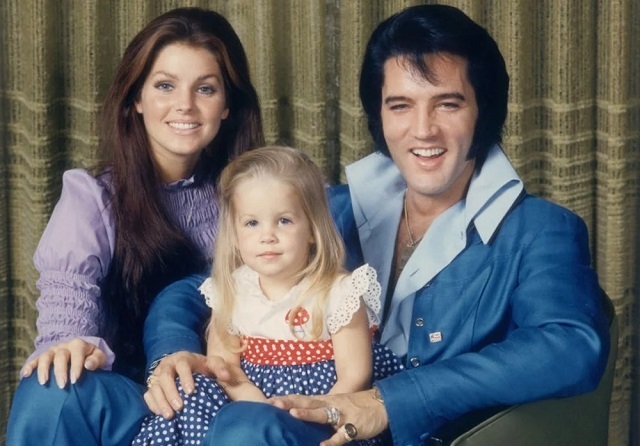 As earlier stated, Presley’s marriage to Priscilla produced a daughter, Lisa Marie. She was just 9 when her father died, leaving her as the sole heir to his estate. Lisa Marie Presley is a musician now and has released three albums till date. She has also been married four times. She got married for the first time in 1988 to Chicago born musician, Danny Keough. They had two children, Danielle Riley Keough (born May 29, 1989) and Benjamin Keough (born on October 21, 1992). They got divorced in 1994. Lisa Marie got married for the second time in May 1994. This time to the king of pop himself, Michael Jackson. The marriage lasted all of two years and they divorced in 1996. Her third marriage was to actor, Nicholas Cage, in August 2002. He filed for divorce in November of the same year and it was finalized in 2004. She got married for the fourth time in 2006 to musician Michael Lockwood. The marriage produced twin daughters, Harper Vivienne Ann, and Finley Aaron Love, born on the 7th of October 2008. The couple split in 2016 following an acrimonious divorce. Riley Keough is Elvis Presley’s first grandchild. She is an actress and producer and has featured in some blockbuster movies such as Mad Max: Fury Road, Magic Mike, and Logan Lucky. She got married to Australian stuntman Ben Smith-Petersen in 2015. Her younger brother, Benjamin Keough, is Presley’s only grandson. He is a musician and has a striking resemblance to his famous grandpa. He keeps a low profile and is rarely in the news. Twins, Harper and Finley are the last but certainly not the least. In 2016, they were removed from their parents care and placed in their maternal grandmother’s custody. This was because their mom, who had checked into rehab, claimed that she had found pornographic material on their dad’s laptop. Their father never faced any criminal charges and the twins are once again living with their mom after she regained custody in the fall of 2017. Elvis Presley died of a heart attack on the 16th of August 1977. In the months preceding his death, he had been suffering from several health implications such as glaucoma, high blood pressure, liver damage and an enlarged colon. All of it was either caused or exacerbated by one sad fact, drug abuse; he had been misusing prescription drugs for quite some time. His health was further complicated by an unhealthy lifestyle that boasted of fatty foods. His death elicited condolences from then-President Jimmy Carter and thousands attended his funeral. He was buried on the 18th of August 1977 at Graceland Mansion, just beside his mom. In the wake of his death, many conspiracy theorists have speculated that he is still alive and only faked his death to escape the demands of fame. His first two tracks, My Happiness and That’s When Your Heartaches Begin, recorded in 1953 were said to have been a gift to his mother. He served his country as a soldier for two years, from March 1958 to March 1960. Rather than take advantage of his celebrity status to serve in the special services division, he served as a regular soldier. He was stationed in Germany and was honorably discharged with the rank of sergeant. Elvis Presley had an identical twin brother at birth that was stillborn. His name was Jessie Garon. Even though he grew up dirt poor, he became rich thanks to his music. He purchased his famous Graceland Mansion at the age of 22 for the price of $102,500. Graceland Mansion is located in Memphis Tennessee and is a major tourist attraction. It is the second most visited house in the U.S. (after the White House) and attracts at least 650,000 visitors each year. Elvis Presley was trained in martial arts during his army duties in Germany. He was awarded the Black Belt before his return to the United States by Hank Slemansky. Presley was Michael Jackson’s father-in-law. MJ married his daughter Lisa Marie Presley in 1996. Despite his worldwide fame, the king only performed in the U.S. and Canada (Ottawa, Vancouver, and Toronto). He never performed outside these two countries and many say that the reason is his manager, Colonel Parker. Parker was an illegal immigrant and feared he wouldn’t be allowed back into the U.S. if he traveled out. Elvis got his first guitar in Tupelo on his 11th birthday – January 8, 1946. Many have said that he was disappointed with the gift as he wanted a bike instead. Elvis Presley is the only music artist to be honored with two U.S. Postal commemorative stamps, in 1993 & 2015. The 1993 stamp is still the most popular U.S. commemorative stamp of all time. Elvis’ first movie was “Love Me Tender” and it was released in 1956. Presley has been inducted into numerous halls of fame. They include the Rock and Roll Hall of Fame (1986), the Country Music Hall of Fame (1998), the Gospel Music Hall of Fame (2001), the Rockabilly Hall of Fame (2007), and the Memphis Music Hall of Fame (2012) etc.